EXORCISM's debut CD I Am God can be described as either classic metal with doom elements or doom with classic metal elements; both tags seem appropriate. On the outside, dark melodic metal might also be a fair assessment? Regardless, there's a very strong BLACK SABBATH influence throughout. To further narrow it down, the best comparison in terms of style and subject matter would be the Tony Martin years - with a touch of the Ronnie James Dio eras. One of the first things that struck me about I Am God is that Lucio Manca's bass lines are very prominent in the mix. He offers interesting melodies within the framework of the songs, with definite shades of Geezer Butler on Heaven And Hell. Csaba Zvekan's powerful voice is the wildcard; his aggressive and bluesy approach fits well with EXORCISM's style and really helps to carry the music. The only negative is that when he gets into the very top of his range, it can sound a little forced. He touches on this part of his voice on numerous tracks, but thankfully it's never overdone to the point of ruining the songs. Guitars are provided by noted Boston gunslinger Joe Stump, the only member of EXORCISM who I was familiar with from his previous work. In this setting, he leans more towards the hyper-blues aspects of his style - with more wah pedal abuse than I am used to hearing from him - alongside his usual healthy dose of Malmsteen/Blackmore-isms. Garry King also deserves a nod for his solid and groovy drumming; he consistently shows restraint and taste while helping to hold everything together. I Am God's ten tracks is a good collection of material - even if there are a few uneven spots - with nothing that feels like it should have been left out. The songwriting and bandmembers' individual strengths gel best on numbers such as “Last Rock And Roll” (uptempo rocker with a nice vocal line); “Voodoo Jesus” (Csaba is reminiscent of RJD on BLACK SABBATH’s Dehumanizer); “Master Of Evil” (features a blazing melodic guitar solo); “Exorcism” (the touch of keys on this one give it a feel similar to something from BLACK SABBATH’s Tyr); and "Fade The Day" (this one conjures up thoughts of BLACK SABBATH’s Headless Cross album, with Stump's playing and guitar tone bringing Yngwie's Odyssey to mind). The production is above average, but as a whole is a little muddy and not extremely cohesive. The mix can also be inconsistent; for example, there are spots where the vocals are obscured by the guitar and bass, with the reverse also true. Overall, it has some of the quirks of a project where the parts have been recorded in separate locations (a very common practice these days) and assembled, reamped and mixed in a central studio. 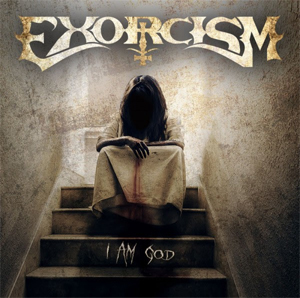 In the final analysis, EXORCISM's I Am God is a modern, doomy take on classic metal. I think they are on to something, and with some slight refinements, they could really carve out a niche for themselves in one of metal's less crowded genres. Recommended. Pick up your copy of I Am God in the KNAC.COM More Store right HERE.